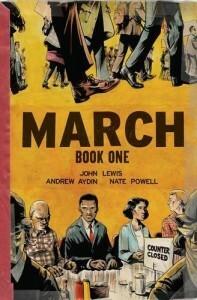 This astounding, fast-moving graphic novel for children, told in the first person by John Lewis about his life and the civil rights movement, brings us right to the heart of the non-violent movement that he and Dr. King were part of. Accompanied by vivid black and white images, we sit at the counter with the students, we get beaten, and we pray with them. The entire graphic novel for children never lets us wander from the subject at hand: racial injustice, and the power of non-violent resistance. The book came highly recommended to me by several sources, but I was unprepared for how deeply personal and human the book is. As we experience historical events through the eyes of one who was there, we are no longer detached from the events. We are participants. In that way, we can viscerally feel the injustice, and the need for change. A graphic novel for children is an ideal way to present history that might otherwise just become a bunch of words on a page. By coupling the dramatic story with images, everything makes sense. Add to that the very compelling language that expresses the story, deeply personal and human. This children’s book is ideal for bringing everyone up to date on the battle that was, and that continues to be fought for racial equality in America. There are three books in this trilogy, and I recommend having the full set. For younger children, definitely check out Preaching to the Chickens: The Story of Young John Lewis, an exquisitely illustrated biography of John Lewis’s early years.